Background We previously reported reduction in the rate of hospitalisations with medication harm among older adults with our ‘Pharm2Pharm’ intervention, a pharmacist-led care transition and care coordination model focused on best practices in medication management. The objectives of the current study are to determine the extent to which medication harm among older inpatients is ‘community acquired’ versus ‘hospital acquired’ and to assess the effectiveness of the Pharm2Pharm model with each type. Methods After a 3-year baseline, six non-federal general acute care hospitals with 50 or more beds in Hawaii implemented Pharm2Pharm sequentially. The other five such hospitals served as the comparison group. We measured frequencies and quarterly rates of admissions among those aged 65 and older with ‘community-acquired’ (International Classification of Diseases-coded as present on admission) and ‘hospital-acquired’ (coded as not present on admission) medication harm per 1000 admissions from 2010 to 2014. Results There were 189 078 total admissions from 2010 through 2014, 7% of which had one or more medication harm codes. There were 16 225 medication harm codes, 70% of which were community-acquired, among these 13 795 admissions. The varied times when the intervention was implemented across hospitals were associated with a significant reduction in the rate of admissions with community-acquired medication harm compared with non-intervention hospitals (p=0.001), and specifically harm by anticoagulants (p<0.0001) and by medications in therapeutic use (p<0.001). The hospital-acquired medication harm rate did not change. The rate of admissions with community-acquired medication harm was reduced by 4.28 admissions per 1000 admissions per quarter in the Pharm2Pharm hospitals relative to the comparison hospitals. Conclusion The Pharm2Pharm model is an effective way to address the growing problem of community-acquired medication harm among high-risk, chronically ill patients. This model demonstrates the importance of deploying specially trained pharmacists in the hospital and in the community to systematically identify and resolve drug therapy problems. ‘Changes are needed across the US health care system to assign the role of primary responsibility to a single clinician or a core group for each patient and ensure the means for easily and effectively communicating what should be a deliberate process of starting, monitoring, and discontinuing prescribed medications across multiple clinicians, caregivers, and health care settings’. Our state-wide medication management intervention called ‘Pharm2Pharm’ did just that—we assigned specially trained pharmacists the role of managing medications across prescribers and settings for high-risk patients. As previously described,6 7 this model assigns hospital consulting pharmacists the responsibility of identifying newly admitted inpatients at risk of medication problems, engaging them, beginning the medication management process and formally handing them off to a community consulting pharmacist at discharge (box 1). Our Pharm2Pharm standard operating procedures are available on request, and our training programme is available as an online 6-hour continuing education activity (http://pharmacy.uhh.hawaii.edu/academics/continuing-education/identifying-resolving-drug-therapy-problems). Uses evidence-based risk criteria to identify patients most likely to benefit from medication management services. Helps them understand the importance of minimising the risk of medication problems. Recommends that they work with a community consulting pharmacist postdischarge (and schedules the first appointment if they agree). Transmits care transition information to the community consulting pharmacist and relevant community-based care providers to facilitate smooth hand-off at discharge. Works with each patient across prescribers and pharmacies for up to a year postdischarge, using standardised medication management processes adapted from best practices20 to optimise the complete drug therapy regimen. Continues to focus on medication issues to prevent subsequent hospital use, particularly immediately after discharge. Works to understand and prioritise according to the patient’s personal health goals and concerns. Although this aggregate population rate—the number of older adult hospitalisations with one or more AHRQ-defined medication harm codes, including hospital-acquired and community-acquired harm, per 1000 older adult admissions—was a useful outcome measure for our state-wide medication management intervention, it does not tell us about the frequency of the different types of medication harm (eg, where the harm originated) or the impact of our intervention by type. This is particularly important among older adults, since the per cent of hospitalisations with medication harm among those aged 65 and older has been found to be twice that of non-elderly adults.10 Therefore, the purpose of this study is twofold: first, to determine the per cent of medication-related adverse outcomes among older adults that are coded as ‘Present on Admission’, which means they originated prior to rather than during the hospitalisation; second, to disaggregate our previously reported results6 to determine if there were significant improvements associated with our ‘Pharm2Pharm’ medication management intervention within subgroups of these medication codes, specifically POA (ie, ‘community acquired’) harm versus ‘hospital acquired’ harm, as well as by drug category and by harm type category. All 13 795 hospital admissions for patients aged 65 or older with one or more medication harm codes among the 11 non-federal, general hospitals with 50 or more acute care beds in Hawaii from 2010 through 2014 were included. Among these 11 hospitals, six implemented our medication management intervention between 2013 and 2014, and five were comparison hospitals, as previously described.6 Admission data were provided by Hawaii Health Information Corporation, the non-profit organisation that maintains the only all-payer, all-visit, longitudinal hospital admission data set in the state. 357.6 (neuropathy due to drugs). 692.3 (contact dermatitis due to drugs and medicines in contact with skin). 693.0 (dermatitis due to drugs or medicines taken internally). 960.0–964.9, 965.02–969.5, 969.8–979.9 (poisoning by drugs, medicinal and biological substances, including overdose of these substances and wrong substances given or taken in error). E850.1–E858.9 (accidental poisoning by drugs, medicinal substances and biologicals, including accidental overdose, wrong dose given or taken in error, and drug taken inadvertently). E930.0–E934.9, E935.1–E949.9 (drugs, medicinal substances and biologicals causing adverse effects in therapeutic use, including correct drug properly administered in therapeutic or prophylactic dosage as the cause of any adverse reaction including allergic or hypersensitivity reactions). Each medication harm code was further coded with regard to the origin of the condition: present (POA) or not present (not-POA) at the time of inpatient admission, insufficient documentation to determine POA or not-POA, clinically undetermined, or unreported. For the community-acquired medication-related hospitalisation rate, the numerator was the total number of admissions with one or more medication harm codes that was POA. For the hospital-acquired medication-related hospitalisation rate, the numerator was the number of admissions with one or more medication harm codes that was not-POA. For both rates, the denominator was the total number of admissions of those aged 65 or older. These ratios were then multiplied by 1000 to produce rates per 1000 admissions of those aged 65 or older and calculated for each hospital for each calendar quarter. Because an admission can have more than one medication harm code, each with its own POA indicator, one admission can be counted in both the community-acquired rate and in the hospital-acquired rate. Frequencies of medication harm codes by POA/community-acquired, not-POA/hospital-acquired and other (ie, insufficient documentation, clinically undetermined and unreported) were obtained across the time period for POA and not-POA medication harm codes. An interrupted time series design with a quasi-experimental comparison group was used to evaluate the effect of the medication management intervention as previously described.6 Our design approach maximises internal and external validity in effectiveness and implementation research.11 Using the quarterly rates in separate analyses—one for the community-acquired rate and one for the hospital-acquired rate—changes over time for the intervention and control hospitals were compared using the linear mixed-effects model previously described to analyse the overall rate.6 In these analyses, the parameter of interest in terms of statistical inference was the interaction between study group and time, testing for a difference in the slope of hospital admission rate trajectories over time by study group. The intervention was modelled as a time-dependent variable to account for the sequential implementation dates at each intervention hospital. In addition, the model adjusted for case mix index at each hospital. We recognise that the outcome of interest in each analysis is a rate, which is generally not normally distributed. To validate our findings using the linear mixed-effects modelling approach proposed, sensitivity analyses were conducted using generalised estimating equations modelling with various outcome distributions (Poisson, zero-inflated Poisson, negative binomial). Since the findings between modelling approaches were very similar, linear mixed-effects modelling was reported for ease of interpretation. All analyses were performed using SAS V.9.4, and statistical significance was taken at the 0.05 level. The 11 hospitals had 189 078 total admissions among those aged 65 or older from 2010 through 2014. Among the 13 795 admissions with one or more medication harm codes, there were 16 225 of these codes, with 85% (11 748) of these admissions having only one code, 13% (1775) having two codes, and the remaining 2% (272) having three to eight medication harm codes. Seventy per cent (11 340) of the medication adverse outcomes were POA/community-acquired and 30% (4,884) were not-POA/hospital-acquired. Only one medication harm code was ‘other’ and was eliminated from all other analyses. Mixed-effects model results (see online supplementary table 1 for detailed statistics) indicate that the community-acquired medication-related admission rate over time in this age group, adjusted for case mix, differed significantly between the study groups (p=0.001). The decrease in community-acquired medication-related hospitalisation rate per 1000 admissions of participants aged 65 and older over time in intervention hospitals was 4.28 per quarter greater than in non-intervention hospitals. 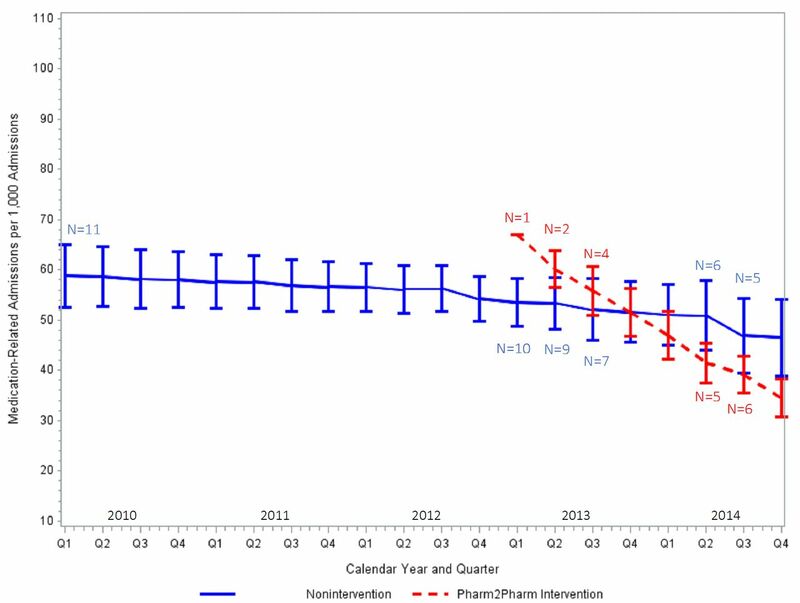 This significantly more rapid admission rate decrease in the intervention hospitals after Pharm2Pharm implementation compared with the non-intervention hospitals is shown in figure 1. Case mix-adjusted predicted community-acquired medication-related hospitalisation rates per 1000 admissions of individuals aged 65 and older at baseline through postimplementation intervention hospitals versus comparison hospitals. ‘N’ refers to the number of hospitals included in each quarterly measure; all 11 hospitals are included in the baseline quarterly measures from 2010 to 2012 (N=11); the intervention began in Q1 of 2013 with the implementation of Pharm2Pharm in one hospital (N=1), followed by implementation at the second hospital in Q2 of 2013 (N=2), at the third and fourth hospitals in Q3 of 2013 (N=4), at the fifth hospital in Q2 of 2014, and at the sixth hospital in Q3 of 2014. The bars represent ±1SD. The hospital-acquired medication-related admission rate over time did not differ between the study groups (p=0.88). Among hospital-acquired medication adverse outcomes, the most frequent medication categories and subcategories were antibiotics (n=843; subcategory: other specified antibiotic excluding penicillins and cephalosporin antibiotics, n=465); analgesics, antipyretics and antirheumatics (n=780; subcategory: opiates, n=591); and hormones and synthetic substitutes (n=561; subcategory: corticosteroids, n=530). For both the hospital-acquired and the community-acquired rates, additional analyses via non-parametric Wilcoxon tests using only the baseline data (ie, first 3 years prior to intervention implementation) indicated no statistically significant differences between the groups during the baseline period. Given the significant decrease in the community-acquired medication-related hospitalisation rate, additional analyses were conducted, using the same mixed-effects model, to explore this rate by medication category and by harm type as defined by the AHRQ.8 Those admissions with more than one community-acquired medication harm code were accordingly counted in more than one of the disaggregated rates. Analyses were conducted for each category and subcategory with a frequency of at least 400 codes over the 5-year period. The drugs most frequently the cause of harm originating in the community were anticoagulants (n=1869), antineoplastic and immunosuppressive drugs (n=1233) and corticosteroids (n=804). The rate of community-acquired anticoagulant-related hospitalisations decreased significantly with our medication management intervention relative to the comparison group (p<0.0001; see online supplementary table 2 for frequencies and p values for each medication category). The decrease in community-acquired anticoagulant-related hospitalisation rate per 1000 admissions of participants aged 65 and older over time in intervention hospitals was 2.2 per quarter greater than in non-intervention hospitals. The other medication categories were not significantly reduced. Descriptive data from the community consulting pharmacists, who were asked to record the number of recommendations they made to resolve drug therapy problems for the following ﻿types of medications—anticoagulants, diabetes medications and Beers criteria12 medications—are shown in table 1, and indicate that 9% of recommendations made during the 2013–2014 intervention period pertained to anticoagulant medications. Hospital consulting pharmacists were not asked to record this information throughout the intervention period. However, this documentation was phased in across hospital consulting pharmacists from July through December 2014 and, as shown in table 1, indicates a similar distribution of recommendations across these medication categories. To further explore the significant decrease in the community-acquired medication-related hospitalisation rate, we conducted additional analyses across medication categories by harm type—adverse effects from medications in therapeutic use, poisoning due to inadvertent medication error and other—as defined by the AHRQ.8 The most frequent harm originating in the community was from medications in therapeutic use, and the rate of admissions with community-acquired harm from medications in therapeutic use decreased significantly with our medication management intervention relative to the comparison group (p<0.001). The decrease in this rate per 1000 admissions of participants aged 65 and older over time in intervention hospitals was 4.4 per quarter greater than in non-intervention hospitals. The rate of admissions with community-acquired poisoning due to inadvertent medication error was not significantly reduced (see online supplementary table 3 for frequencies and p values by harm type). We found that the majority (70%) of medication-related harm seen among older inpatients during a 5-year period was community-acquired, suggesting the importance of targeting ambulatory and other community settings for improvement. This represents an important shift as previous national efforts have focused on reducing hospital-acquired harm.13 We also found that our medication management intervention, previously found to be associated in time with reduction in the overall rate of medication-related hospitalisation among older adults,6 was specifically effective in reducing the community-acquired harm rate, the community-acquired anticoagulant harm rate and the community-acquired harm rate from medications in therapeutic use among this population. Based on the parameter estimates, the reduction in community-acquired medication-related admission rate associated with our medication management intervention compared with non-intervention hospitals (decrease of 4.28 per 1000 admissions per quarter) is nearly as large as (only 3% less than) the effect we previously reported—an aggregate rate decrease of 4.43 per 1000 admissions per quarter—based on admissions with any medication harm whether it was POA (ie, community-acquired) or hospital-acquired.6 The reduction in the community-acquired anticoagulant-related admission rate is approximately half as large as (48% less than) the reduction in the overall community-acquired rate, suggesting that there were beneficial effects with other medications where smaller numbers precluded demonstrating statistical significance. The reduction in the rate of admissions with community-acquired harm due to medications in therapeutic use included all medication categories and is slightly (4%) larger than the reduction in the overall rate of admissions with community-acquired harm. This demonstrates a robust effect of Pharm2Pharm in reducing community-acquired harm from medications that were properly prescribed and used rather than from medication errors. The ICD codes we used do not disaggregate by specific drug, but our findings of the frequency of harm from anticoagulants are consistent with the previous finding by Budnitz et al.14 They found that warfarin is the most commonly implicated medication in hospitalisations for adverse drug events among older adults, accounting for one-third of all such admissions. In our study, anticoagulants were the most frequent medication category causing harm in community settings among older inpatients (ie, 16.5% of all community-acquired medication adverse outcomes seen among hospitalised patients). Our findings indicate that this per cent would have been higher without Pharm2Pharm. In the Budnitz et al 14 study, the adverse drug event was the cause of admission. In our study, the medication harm may or may not have been the reason for admission. However, the significant reduction in admission rates associated with our medication management intervention suggests that these medication adverse outcomes often are the reason for admission. Our results also support the evidence-based, patient-centred approach to choosing oral anticoagulation therapy as recommended by Shields and Lip15 to optimise the risk:benefit ratio. For decades, ‘anticoagulant clinics’ have provided services designed to improve safety in the use of these medications. A systematic review of the research indicates that outpatient pharmacist-managed anticoagulant services result in improved clinical outcomes and lower healthcare utilisation relative to usual care,16 although a recent survey indicates about one-third of anticoagulant clinics do not use pharmacists.17 In our model, community consulting pharmacists made nearly 400 recommendations to resolve drug therapy problems pertaining to anticoagulant medications across the intervention period from 2013 to 2014. Thus, the associated decrease in the rate of admissions with community-acquired anticoagulant harm is not a surprise. However, this decrease is only half as large as the decrease in the overall community-acquired medication-related hospitalisation rate, and anticoagulant-related recommendations represented only 9% of the community consulting pharmacists’ recommendations. This suggests that there was substantial benefit from the pharmacists identifying and resolving drug therapy problems across the medication regimen among the high-risk, complex patients enrolled in Pharm2Pharm. To further explore the admissions with community-acquired harm, we examined rates disaggregated by type of medication harm. The Pharm2Pharm model was not associated with a reduction in the rate of admissions with community-acquired harm due to poisoning from inadvertent medication errors (eg, accidental overdose, wrong medication). In contrast, the decrease in the rate of admissions with community-acquired harm from medications in therapeutic use (ie, correct medications, properly administered) was actually a bit larger than the decrease in the overall rate of admissions with community-acquired harm. This finding underscores the value of deploying pharmacists as medication experts focused on optimising the complete medication regimen using best practices in medication management,20 which goes beyond just ensuring proper use of each medication. This includes careful monitoring, especially of high-risk medications, preventing interactions with over-the-counter medications and supplements, and facilitating the switch to safer, better tolerated medications. These results demonstrate that at least some of the adverse effects from medications in therapeutic use are preventable by pharmacists who are specially trained in optimising medications through a systematic, patient-centred process of identifying and resolving drug therapy problems. Another limitation is that our measure relies on the ICD coding system and the documentation on which it is based, which may result in underestimation of medication harm. For example, there are no ICD-9 codes for untreated indications or dosing too low to be effective.10 While the ICD-10 has a code for underdosing harm, research indicates that this newer version of ICD also underestimates the number of admissions with medication harm.22 With regard to the use of the POA indicator, only one out of more than 16 000 medication harm codes was undetermined as to whether it was POA or not. This suggests that documentation is sufficient to make this determination, although research on the reliability of these codes would provide clarification. To our knowledge, no studies have tested the validity of the POA indicator as a measure of community-acquired versus hospital-acquired medication harm. An additional result we find interesting and worthy of further research is the relationship between hospital case mix and medication harm. Hospital case mix was a significant predictor of hospital-acquired medication-related admission rates, but not community-acquired rates. To the extent that case mix is an indicator of disease severity,23 24 a possible explanation for this finding could be that medication harm that occurs in the community is different from that originating in the hospital. Anticoagulants were the most frequent cause of community-acquired medication harm, while antibiotics were the most frequent hospital-acquired. In addition, factors such as health literacy, language barriers and lack of adequate monitoring may be more important factors than disease severity in the cause of medication harm originating in community settings.25–27 In the hospital setting, clinical staff administer and closely monitor medications and have translators to address language barriers. Thus, disease severity, which can correlate with the number of medications and complexity of the medication regimen,28 might be the primary factor contributing to the risk of hospital-acquired medication harm. Finally, additional research is needed to determine the frequencies of medication harm categories among non-elderly and in hospitals outside of Hawaii. While there may be variation in coding practices across regions and settings, these medication harm codes appear to be a useful way to monitor population rates of medication problems and should be further explored within the current ICD-10 codes. Community-acquired medication harm is more frequent than hospital-acquired among older inpatients. These community-acquired adverse outcomes generally, and particularly harm from anticoagulants and from medications in therapeutic use, can be significantly reduced by improvements in medication management as we demonstrated with our Pharm2Pharm model. The integration of specially trained pharmacists into care teams, specifically assigning them responsibility for systematically identifying and resolving drug therapy problems across prescribers, is an effective way to address the growing problem of medication harm among high-risk, chronically ill patients in community settings. We would like to acknowledge the leadership of the participating hospitals and community pharmacies that served as operating partners, the consulting pharmacists who performed the clinical services, and the Pharm2Pharm project team who provided administrative support. US Department of Health and Human Services, Office of Disease Prevention and Health Promotion. National action plan for adverse drug event prevention. Washington DC: US Department of Health and Human Services, Office of Disease Prevention and Health Promotion, 2014. Agency for Healthcare Research and Quality. National scorecard on rates of hospital-acquired conditions 2010 to 2015: interim data from national efforts to make health care safer. Rockville, USA: Agency for Healthcare Research and Quality, 2016.
. Medication-related adverse outcomes in US hospitals and emergency departments, 2008: statistical brief# 109. Rockville, MD: Agency for Healthcare Research and Quality, 2011.
. Origin of Adverse Drug Events in U.S. Hospitals, 2011. HCUP Statistical Brief #158 ed. Rockville, MD: Quality AfHRa, 2013. US Department of Health and Human Services, 2018. About the partnership for patients: US department of health and human services, partnership for patients. Available from: https://partnershipforpatients.cms.gov/about-the-partnership/aboutthepartnershipforpatients.html [Accessed 21 May 2018].
. Pharmaceutical care practice: the patient-centered approach to medication management. McGraw Hill Professional, 2012. Contributors KP: model design and study concept, principal investigator of the CMS Health Care Innovation Award, drafting all sections of the manuscript except the statistics section. LK, SJ-O, AC: model design and launch. JL, TM, AB, LG, MB-M: model design. AL, AH: data analysis and interpretation, drafting the statistics section of the manuscript. JM: acquisition and interpretation of data. All authors reviewed the manuscript for critical content and editing. Funding This project was supported by Funding Opportunity Number CMS-1C1-12-0001 from the Centers for Medicare and Medicaid Services, Center for Medicare and Medicaid Innovation. Its content is solely the responsibility of the authors and does not necessarily represent the official views of the HHS or any of its agencies. Ethics approval University of Hawaii.